The classic seven: That increasingly rare breed of New York City apartment, almost non-existent among condos, was much more often seen in the pre-war era, before building owners felt the need to pack as many people as possible into every square inch. 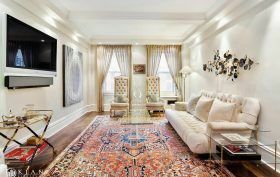 This particular specimen in The Gatsby at 65 East 96th Street can be found on the market for $3.195 million in its most likely habitat, the Upper East Side, and it’s a beauty. Everything has been perfectly updated for 21st-century living and gorgeous pre-war details are at their best. There are even building amenities, plus the freedom of condo ownership, but mostly it’s the kind of apartment that only needs to show its floor plan.